So, me and labba94 have been discussing the big mysteries of DC. Here's a theory/overview from the results that I came to. THIS THREAD HAS A LOT OF SPOILS INCLUDED SINCE IT REVOLVES AROUND THE LATEST CHAPTERS/STORY! IF YOU ARE LOOKING FOR A SPOILER-FREE DISCUSSION THREAD, THIS IS NOT FOR YOU! this is a subject that is a bit hard to address directly since we've only gotten puzzle pieces. The most common possibility, from a typical story standpoint, is that it's deeply connected with the main Antagonist(the Boss). We can pretty much assume that the APTX4869 research is the Boss' true goal, or at the very least a part of it. Since we know that a multiple of big unbelievable names is supporting the organization(File 475), and that Pisco expressed knowledge of the Miyano's research(File 242), it's likely to assume that the big names, along with Pisco, were funding the Miyano's research. It would mean that the boss had to have at least approved the research, if he/she were to accept financial support. On the other hand, Itakura's software really didn't show any significant connection to the boss, but rather to someone who is likely Vermouth. - Calling Sherry's parent's research foolish (File 434). - Attempting to kill Sherry, the only researcher with a lot of knowledge of the APTX research, no matter the cost (File 434, File 824[risking her secret being exposed if Bourbon died]). - her state of not aging, that she doesn't seem too fond of(talking about "angels never smiling upon her"[File 350]), as a possible result of the research. 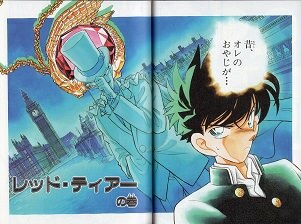 - her constant hope and trust on the "silver bullet"(Shinichi) taking down the BO(most likely because of their goal). Another suspicious incident was how Sherry's parents died. The BO wanted to use the Miyanos for their own research, which was indirectly stated by Haibara in her thoughts(File 948). Assuming the parents death wasn't an accident, If they wanted to change the directory of the SB(Silver Bullet) project towards their goal, than the easiest way is by manipulating them into doing it through threats, instead of killing them and use their infant daughter. Even if that was the case, it was a very sloppy move to burn them in their research laboratory, since it could burn important research data and materials that they need, which it did(File 948). This also leaves me to believe that the accident was orchestrated by Vermouth, who we know has shown reasons to stop their research. If Itakura's software is connected to the progression of the APTX research, then it's doubtful that Vermouth would contribute as much as she did, if the one on the phone with Itakura was indeed her. This leads me to believe that the Itakura software is NOT meant to fulfill the BO's true goal, if vermouth was the one that ordered Itakura. In short, we can consider the APTX research as the Boss' only true goal. Sherry took over the research of her parents and used their research materials, that was left after the accident, as a foundation. What she didn't know was that she was working with a different drug, "APTX4869", which was the drug the BO was trying to make, contrary to the "Silver Bullet" project that her parents were working on(File 948). Haibara clearly expressed her regret of starting something that was never supposed to be done(File 821). - Atsushi Miyano was considered a "Mad Scientist" because of his abnormal style of thinking and theories(File 384). - Elena Miyano refers to it as a "terrifying drug" while their research mates called it a "Dream drug"(File 821). What can we get from this? let's start with Atsushi. Gosho loves making reference to old famous novels. The "mad scientist" is clearly a reference to Frankenstein, where Frankenstein created an artificial human. The reason for Frankenstein being called a "mad scientist" is because he tried to achieve something that should be beyond the capacity of a human, and that goes to a forbidden realm, namely the God's realm(according to religious believes). things that classifies as "Godly" are things that is believed to only be achieved by a God, like "Control and creation of life" and "Immortality". So far, we know an effect of both drugs(APTX & SB) that fall into the first category, taking life without a trace("Control of life"). APTX is so far the only confirmed drug that has an effect that falls close to the second category, lengthening life through shrinking (Immortality). Since APTX was based on the research materials of SB project(that was left after the "accident"), it is highly likely that SB possess a similar effect. Our first hint to that is Vermouth. Since she has shown signs of not aging since earliest 20 years ago(File 433), 2 years before Sherry(APTX creator) was born and the Miyanos' death, she is most likely a "victim" of the SB drug, and therefore falling even closer to the second category, halt aging (immortality). The fact that such an effect is shown, through Vermouth, indicates that the "dream/terrifying drug" that the parents were working on has to be something that gives longevity/halts aging. This is something that would label anyone, who is trying to achieve that, a "mad scientist", since it's an effect close to immortality(a divine feature). Another hint to that is Sherry's name, "Miyano Shiho", was written in a guest book of people who wished for longer lives(File 281). Even Conan thought it was strange for Haibara to want it, and sure enough, Haibara had said before that anyone who tries to go against the stream of time will be punished(File 191). This implies that she had no interest in the idea of things like longevity, that goes beyond limits set by the stream of time, and that it might have been her parents who wrote her name in the book instead, wishing their daughter a longer life, which indicates that they are interested in the concept of longevity(immortality). So what does this say about the APTX research, the BO's true goal? "We can be both of God and Devil, since we're trying to raise the dead against the stream of time"(File 380). This comment is something similar to what Vermouth would say(talking about God and Angels). Adding to the fact that Vermouth didn't show signs of denying it when Yukiko presumed it was her(File 823), it makes it more likely that it indeed was Vermouth on the phone. What we know of Vermouth is that she usually makes references to history or novels(like during File 500, about a perfect "hunting ground"). Her comment to Itakura could be a reference to Frankenstein's original inspiration, "raising dead corpses". Luigi Galvani was someone who researched "animal electricity" and his nephew Giovanni Aldini used his unlce's electricity research to make corpses of executed criminals sit upright, as well as making eye, jaw, hand, leg and thigh movements with the help of implanted metal rods. Their research gave rise to the idea of electric reanimation(raising the dead through electricity) and it was a huge influence to Mary Shelley's(author of Frankenstein) novel(for more info:https://www.insidescience.org/content/science-made-frankenstein/1116). Vermouth's reference is most likely a metaphor that is indicating that the BO is trying to achieve something outrageous, equivalent to electric reanimation(raise the dead), and that belongs in the realm of God, similar to the Miyanos'. It further implies that their drug can be used for good and bad, hence making them God and Devil. The fact that the BO needed the Miyanos' research, in order to make their drug, further clarifies that what they are trying to achieve is still in the realm of God. Then what could the APTX4869 research's purpose be? Raising the dead would've have sounded like reasonable assumption, since it could lead to both good and bad aftermaths. Obviously, that is not the case either according to Haibara. 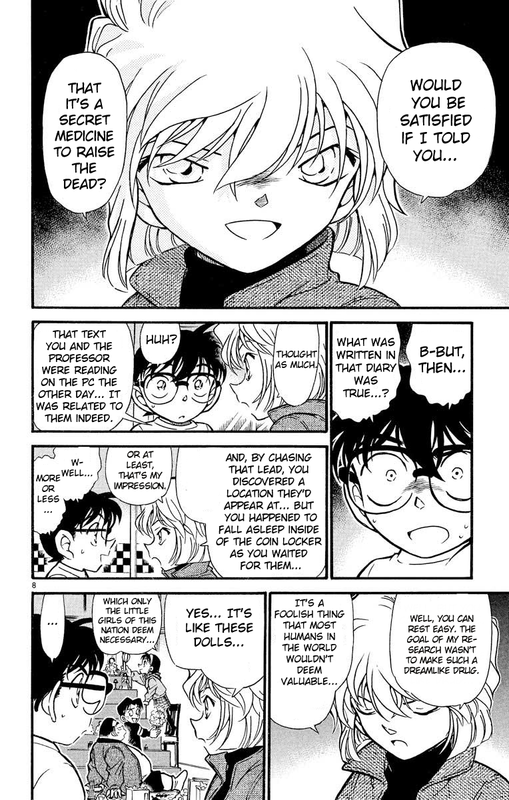 Haibara gives us another interesting angle on the APTX research's purpose, after telling Conan that it has nothing to do with reviving the dead. She claims that the APTX research is something that most people would consider non-beneficial or uninteresting, just like the Japanese dolls that only interests Japanese female kids(File 384). Going by the logic that the research is deeply connected to the Boss, this statement could be indicating that the APTX research is more beneficial to the Boss than to other random people. A possible purpose for the drug, that falls close to this scenario, is a cure. It has been speculated before that the boss could also be a shrunken adult(hence the dial melody of the Boss phone number being the song "Nanatsu no Ko"="child of seven"(or "Seven Children")[File 475] that indicates the Boss is a 7-year-old child), just like Shinichi(which creates a perfect parallel). If the Boss is trying to develop a cure for his condition, it would make sense why it wouldn't seem that beneficial to others, and that "immortality-like" features is needed in the drug to "reverse an age regression"/"speed-up aging". When it's completed, maybe it can be used to speed-up the growth of other things like bacteria and viruses, to be used as weapon or be utilized for medical purposes(hence making the drug good and bad). This leaves us with questions like "how did the boss shrink in the first place?" It's possible that Conan's recall on haibara's statement, about punishment that awaits those who rush and forcibly tries to go against the stream of time(File 380), is a foreshadowing to what could have happened to the Boss. The Boss might've previously tried to achieve something like a "growth speed-up/rushing drug", and ended up shrinking as a result from a prototype side-effect, as a form of "punishment". We find out that Tequila had a mission to make a trade with a Mantendo company worker and that he was apparently supposed to retrieve a list of professional programmers(File 116). It's unknown who this was ordered by. Long after that, we found out that Itakura Suguru had already been manipulated to agree on working with a software. He was requested to make a software with an unknown purpose(File 380). If the woman is Vermouth, it's less likely that it had something to do with the BO's true goal, since she wouldn't have cooperated to that extent to something she despises. The that fact they were still looking for a programmer, after already requesting Itakura, hints to that he might've been slowing down on his work, probably because of his eyesight going bad and that he had doubts. The fact that Sharon(Vermouth) always argued with him a lot(File 823)(because she probably didn't like the program project he was working on in the past) strongly implies that there must be something to gain from using him and his project(despite not liking it). Then what could Itakura's software's purpose have been? Our biggest clue was the conversation that took place between Yukiko and Vermouth in the Mystery Train Case(File 823). After asking why Vermouth is hiding Shinichi and Shiho's shrinking, Yukiko mentions that she and Conan are suspecting that Itakura's software might have something to do with why Vermouth is hiding Conan and Haibara's shrinking. Vermouth reaction to Yukiko seemed to point that it hit the mark. 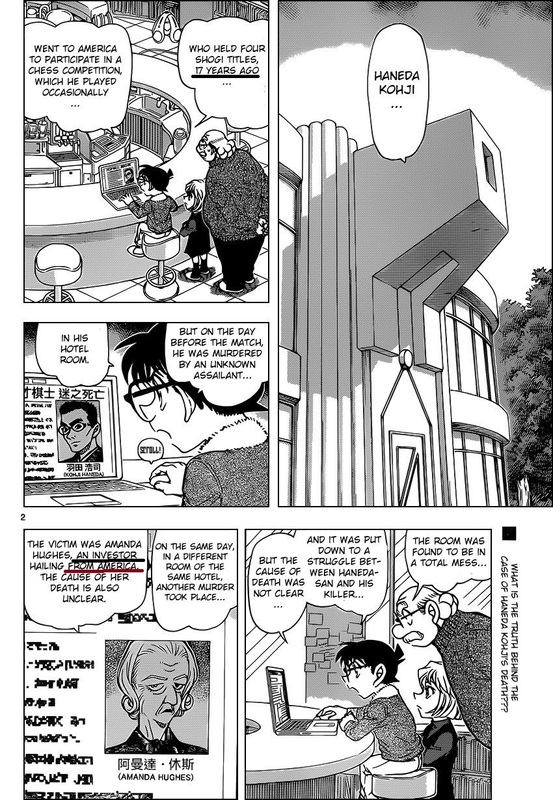 If Gosho is indeed implying that the software is connected to why Vermouth is hiding it from the BO, and since we know that Vermouth found out about the shrinking effect long after she already ordered Itakura, it means that the thing she is trying to cover up is something that the shrinking effect might reveal about something in the past. Examples to what it could be is the progress of the APTX/SB research and the truth behind the Miyanos' accident. If Vermouth hid her halted aging from the boss and the rest of the BO, in other words, the effect of what SB might've done to her, then it makes sense that she would want to hide the progress of Sherry's research, who is based on the SB project. This could most likely be what motivates her to keep her Boss-relationship-secret(File 898) hidden from the BO. If the Boss were to find out that his relationship with "Chris" is the same as with "Sharon", the Boss would realize immediately that they are the same person, and that she has been keeping the info of SB's progress a secret, and then eventually conclude that she was behind the Miyano accident. Whatever their relationship may be, this could be the main reason why it's such a big deal to keep it hidden. 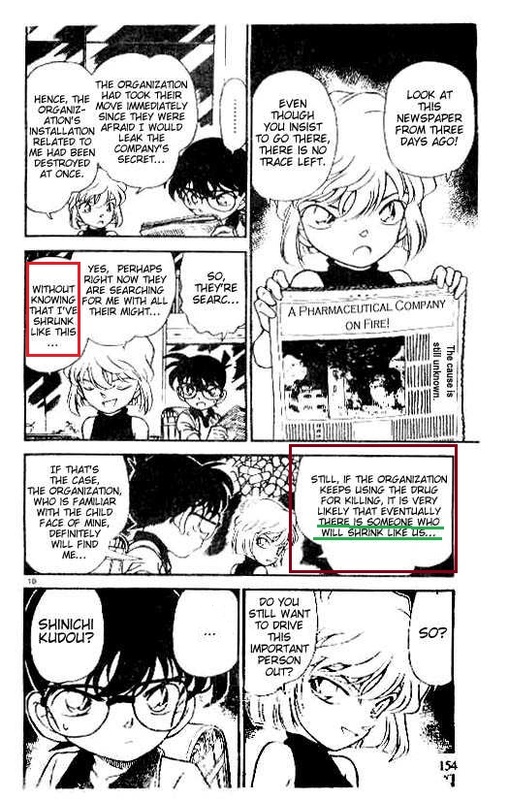 If that's the case, going back to Yukiko and Conan's suspicion about the software's purpose, maybe Vermouth wants to use the software to hide information on "the drug's progress"/"her double identity"/"Miyano's accident". It could be through the means of erasing all information of the drug from the BO database(like the "Night Baroon" Virus), as well as hack into hospital database to change/delete "Sharon's" DNA information, in case the Boss wants to verify if she is the same person(which could be the ongoing case, considering she may have been in a hurry to finish the software). Whatever the software does, If it's used incorrectly, it could potentially harm humanity, which is what Itakura was implying(File 380). What's left in Itakura's diary is the info of the "cat" that bothered the caller(likely Vermouth) with it's loud cry before making her hang up in a hurry(File 398). If for some reason, however unlikely, the caller wasn't Vermouth who talked to Itakura, then the cat in the background could attest to that, since Vermouth has never been shown with a cat. But we still have no confirmation that the sound Itakura heard was from a cat. It could have been someone captured, that had their mouth taped/covered, making cat-like sounds in order to call for help for example or some kind of relevant sound interference. Either way, it was definitely given to us as a foreshadowing to something down the road. - The Boss of the Black Organization's True goal most likely lies only in the APTX4869 Research, Sherry's research, and not in Itakura's software. - The Organization's aim was to use the Miyano's, Sherry's parents', research(Silver Bullet Project) as foundation for their own. The Silver Bullet project's purpose is most likely to achieve longevity/halted-aging. - The APTX4869 research is something that might be more beneficial to the Boss than anyone else. Example for that is a cure for his possible shrinking. In that case, the true effect of the drug is likely to "speed-up aging"/"rushing growth"(not necessarily just on humans). - Itakura's software's purpose is probably to ultimately hide the progress of the research, Vermouth's double identity or/and the truth behind the Miyano accident. Vermouth was the one that orchestrated the "accident". - Vermouth's secret relationship with the Boss is important to hide because she is hiding her halted aging(double identity) from the whole Black Organization, including the Boss. If the Boss found out about the secret relationship, he would realize that she is the same person as her "mother", and eventually, everything she attempted to hide with Itakura's software. Last edited by MeiTanteixX on May 8th, 2018, 3:47 am, edited 8 times in total. It seems like the major points of disagreement between your theories and mine are Itakura's program and the boss's knowledge of Vermouth's aging. There are a few other things, but those are the two big ones. With Itakura's program, you don't outright state it, but I get the impression you think it was maybe something that Vermouth ordered for her personal use and intended to keep secret from others. The thing that bothers me about that idea is the involvement of the other BO. Tequila we don't know much about and thus could have been twisted around Vermouth's little finger, but Gin and Vodka were behind round 2 of the attempt to collect. Gin's disposition at the time towards Vermouth, and by extension Vodka, mean they are unlikely to willingly participate in anything primarily for Vermouth's personal gain. Second, I would expect Vermouth herself would be the one who would try to rendezvous with Itakura instead of Gin or Vodka if it was that important to her. Third, the possibility that Vermouth somehow tricked or coerced Vodka into collecting the disk for her seems unlikely because Vodka's boss seems to [correctly] pick right up on her impure motivations. Gin was paying attention because he was monitoring Vodka's progress and turned out when an unexpected change in plans occurred. Gin only very grudgingly listens to Vermouth and as we have seen in later cases (eg Train) prefers to do things his own way rather than join with her plans. I also came to opposite conclusion about Vermouth's behavior towards Itakura. I assumed her uncharacteristically snapping at him is because she was taking her frustration for his views or his personal project out on him. Itakura still worked in CG for movies when the argument happened, meaning it was at least a year before Tequila first appeared (Itakura quit CG 3ya, Tequila showed up 2ya). At that stage, Itakura's project would still be personal and not an order. That said, I wouldn't be surprised if the BO had influenced his decision to commence his initial project and was watching from the sidelines cheering him on so to speak. I have also wondered (without evidence) if Vermouth was the one who ruined Itakura's eyesight slowly to slow him down. About Vermouth's participation in ordering a software from Itakura that may advance an agenda that Vermouth hates, it is possible the boss ordered her to since she was semi-close to Itakura even if enemies. Based on her prior behavior, if the boss asked, Vermouth would do it. She seems to be more of a "say yes and do it, but do secret stuff on the side" than a "defy orders" type. I personally have a hard time believing the boss wouldn't find out about Vermouth's aging. She is an upper level member of the Org who presumably has been around for quite a while (at least 20 years) and is currently the favorite of the boss and has been at his side, but her adversary is probably on par with Conan or Yuusaku in intelligence. My take on this is that the boss knows about Vermouth's condition fully, but Vermouth is trying her damnedest to suppress any information about new shrinking. That is Vermouth wants the boss to think whatever happened is a one-time incident that cannot be replicated. Personally, I think Vermouth is trying to end the boss's ambitions without crushing him (personal relationship reasons) by causing promising projects to fail. She goes after anyone continuing the Silver Bullet/APTX project (Haibara), and anyone that might notice her aging problem and then start a project for themselves (FBI/USgov) that the boss might be able to take advantage of. My guess is Vermouth also tries to suppress anyone in the BO who might find out about her personal condition. The blackmail Amuro might be holding over her head might reveal that she is Sharon if a knowledgeable person compared it to another piece of info. Chekhov MacGuffin wrote: With Itakura's program, you don't outright state it, but I get the impression you think it was maybe something that Vermouth ordered for her personal use and intended to keep secret from others. The thing that bothers me about that idea is the involvement of the other BO. Tequila we don't know much about and thus could have been twisted around Vermouth's little finger, but Gin and Vodka were behind round 2 of the attempt to collect. Gin's disposition at the time towards Vermouth, and by extension Vodka, mean they are unlikely to willingly participate in anything primarily for Vermouth's personal gain. Second, I would expect Vermouth herself would be the one who would try to rendezvous with Itakura instead of Gin or Vodka if it was that important to her. Third, the possibility that Vermouth somehow tricked or coerced Vodka into collecting the disk for her seems unlikely because Vodka's boss seems to [correctly] pick right up on her impure motivations. Gin was paying attention because he was monitoring Vodka's progress and turned out when an unexpected change in plans occurred. Gin only very grudgingly listens to Vermouth and as we have seen in later cases (eg Train) prefers to do things his own way rather than join with her plans. Yes, like you said, I wasn't giving a official statement on what it is, but rather simply put, what it's ultimate goal could have been. I didn't dive too deep into it on my first post, but I'll relay some of my thoughts regarding Gin and Vodka's involvement. As you mentioned, Gin wouldn't just take orders from anyone, and although he acknowledged Vermouth as a high-ranking member of the BO(File 242), he was always portrayed as the Boss' loyal dog. In this case, what I think could have transpired is that this overall mission of retrieving a software wasn't meant for Vermouth's gain in-name. Vermouth could have suggested the software to the Boss and persuaded him that it works on his favor, while in reality, it's a double-edged sword that she's planning to utilize. Itakura's worries over its potential harm to humanity could be through the usage that Vermouth suggested to the Boss. Vermouth knows full well the Boss' demeanor and carefulness(File 704) and with her acting skills, I wouldn't put past her ability to persuade him and have a stand in giving advise(like Rum might have), especially since she's considered the Boss' favorite(File 429, File 501). Doing that, she avoids the risks like being exposed later on after making a secret exchange with Itakura. Chekhov MacGuffin wrote: I also came to opposite conclusion about Vermouth's behavior towards Itakura. I assumed her uncharacteristically snapping at him is because she was taking her frustration for his views or his personal project out on him. Itakura still worked in CG for movies when the argument happened, meaning it was at least a year before Tequila first appeared (Itakura quit CG 3ya, Tequila showed up 2ya). At that stage, Itakura's project would still be personal and not an order. That said, I wouldn't be surprised if the BO had influenced his decision to commence his initial project and was watching from the sidelines cheering him on so to speak. I have also wondered (without evidence) if Vermouth was the one who ruined Itakura's eyesight slowly to slow him down. thanks for clarifying the timeline. Taking into consideration what I wrote above, it could very well coincide with your reasoning on her behavior towards Itakura. If it was a project he initially started on his own, and in the case of that it can work in both Vermouth's and the Boss' favor(depending on how it's used), it would make sense why she would take out her frustration on him because of his project/views and its negative potential. Chekhov MacGuffin wrote: About Vermouth's participation in ordering a software from Itakura that may advance an agenda that Vermouth hates, it is possible the boss ordered her to since she was semi-close to Itakura even if enemies. Based on her prior behavior, if the boss asked, Vermouth would do it. She seems to be more of a "say yes and do it, but do secret stuff on the side" than a "defy orders" type. I definitely agree on her being the type that doesn't make her disagreements apparent(excluding Itakura), especially to someone like the Boss. However, there are two things that gives me a different impression. The first one being the vague set-up that Vermouth might be behind the Miyano accident. This is of course not an official matter, but we can definitely agree that they didn't die by an accident. Most accidents on mystery stories, that are implied to be one before the full picture is revealed, usually aren't accidents. From their plans on leaving their kids(and Rei) in order to finish the drug, to the sudden "accident" in the laboratory, it all just screams fishy. The point I'm trying to make is that the BO has no gain in killing their important researchers, so it's most likely Vermouth behind it(as mentioned in my first post), hence showing how desperate/willing she is in stopping the Boss' goals. In this line of thought, if she was ordered by the Boss to force Itakura to complete the software, it would go against her nature that she didn't intervene with the progress. You suggested the idea of her being behind the eyesight going bad, but that wouldn't effectively stop/slow down the progress as well as what the "accident" did on the whole research. I wouldn't put past her orchestrating Itakura's suicide, if she really wanted to do "secret stuff on the side" in this case. The second one being Yukiko's words during the mystery train(File 823, specifically the picture on the first post). "But that software you put so much effort into ordering...". This comes from a character who obviously doesn't know the complete truth, but this is something Gosho always does during every case. 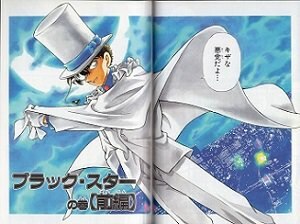 Gosho usually gives out clear questions through his characters that he wants the readers to think about, in order to construct a path of discussion towards the truth. The way it's worded out(if the translation is accurate), it's implying that notable effort was made by Vermouth in ordering the software, which clearly contradicts the idea that she begrudgingly followed the Boss' orders. 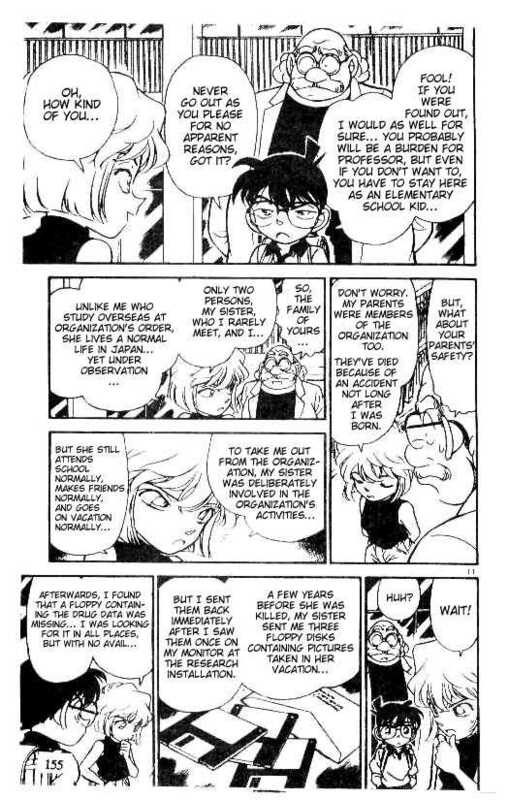 From that, rather than misleading the readers, it looks like Gosho is trying to convey that Vermouth clearly had things to gain from it. Chekhov MacGuffin wrote: My guess is Vermouth also tries to suppress anyone in the BO who might find out about her personal condition. The blackmail Amuro might be holding over her head might reveal that she is Sharon if a knowledgeable person compared it to another piece of info. But if the Boss already knows about it, what difference would it make if the rest of BO finds out be her condition and double identity? I don't see any actual consequences in that regard, that would force her to help Bourbon, unless her true connection to the Boss could ultimately reveal the progress of the APTX research(something we know she is trying to hide). If she's worried that spies within the BO will find out, then it's a bit too late, since she has already failed hiding it from jodie and the FBI. I also doubt her connection to the boss would reveal the boss' identity, since he should have already destroyed any leads about his true past that would connect him to Vermouth, if he is as careful as he's claimed to be. Of course, it's too early to assume otherwise, but I personally don't think Gosho would introduce a new subplot regarding the importance of Vermouth hiding her condition from the BO, excluding the Boss. It has to tie in to what's already presented. Last edited by MeiTanteixX on August 14th, 2016, 7:54 am, edited 1 time in total. I feel like Rum will have something to do with the cat and the woman on the phone instead of Vermouth. You can connect quite a few plotlines to the situation 17 years ago. Investor's name before she joined the org..
Haibaras parents died not long after she was born in an accident. Rum lost his/her eye in an accident in the past? If not long after means like Haibara was born 18 years ago, I wonder... She must have been 1 year old or less I guess. Now that I think about it there are quite a few incidents that will most likely connect together. 4. The incident where Miyanos died. k11chi wrote: I feel like Rum will have something to do with the cat and the woman on the phone instead of Vermouth. You can connect quite a few plotlines to the situation 17 years ago. I would've loved it if that were the case, since it would serve as brilliantly done foreshadowing, but I doubt that is the case, since I'm not even sure if Gosho had the details regarding the second-in-command "Rum" in mind during that time. We'll have to wait and see I guess. first of all, I need to know if it really says "the person". Shouldn't it be saying "the people who invested", because it's too weird that they would only have one investor. Like I mentioned before, Pisco and the other "unbelievable names" could also be investing to the research. I agree though that Amanda Hughes most likely is among the investors(which shouldn't come as a surprise either). k11chi wrote: Now that I think about it there are quite a few incidents that will most likely connect together. 1. I think that it will tie into Rum, and that he might be responsible(if Kuroda isn't Rum himself). 2. 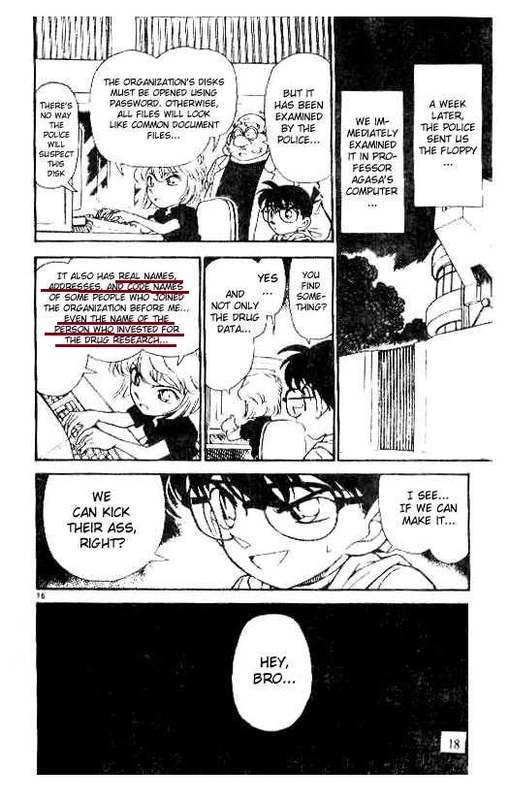 Not sure if we should consider this as anything important, but since we got more than just this regarding Bourbon's past and connections in File 825-827(the other one being "the friend from a security company that taught Rei how to open locks"), along with the vague implication that he could be british, I wouldn't put past Gosho highliting these in a future case. 3. This is probably gonna connect to Rum's accident, if he isn't Kuroda(that had his accident 7 years after). Mary could also be connected to this incident, if not just Mr. Akai. Asaka is most likely Rum, but there's the slight chance that it's a red-herring too, and that it could be someone else, like Akai's father(if he isn't Rum) or Mary in disguise. 4. like I said, has to do with Vermouth. Mary could have also been involved, leading to her shrinking by SB, but that would imply that she didn't age much, if at all, during 18 years after shrinking. The fact that Mary seems to be looking for Sherry implies that she might be aware of her research, which in turn could be implying that she is directly involved with APTX, rather than SB. I'm betting on that Sera and Mary are behind the leaking. I imagine the Kuroda one is connected to Rum`s accident directly but maybe nothing else. I've been thinking, maybe the Itakura program is meant to help further the APTX4869 drug as peer requested by Anokata of Tequila's gain of the list and of Vermouth's deal with Itakura due to the knowledge of the common line of work between the two. Vermouth on the other hand want to have the program beforehand to prevent Anokata from having it, therefore Anokata who is not rushing it is aware of Vermouth's impulsiveness. Bringing his suspicions towards her and sending Gin and Vodka to make sure things get done. However, Vermouth's claim regarding God and the devil, emphasizes that we can be both creators of life and creators of sins. As such, Anokata's original plan is to create a drug that is capable of enhancing the human cells to a degree where injuries and illness are near to impossible (Creating life like a God), but as a side effect deaging happens which explains why Itakura was charged with creating the program in order to ensure it would keep the aging process normal but also enhancing the potentiality of human cells. Therefore regarding Vermouth as favorite due to her involvement in the drug and thus is holding the key to revise the deaging drug, while I don't think Anokata is a child but may have deaged to young adulthood if deaged at all. That would make sense as to why Itakura heard the voice of a cat and why Vermouth rushed in hanging up, if this holds up, then the cat as once mentioned by Gosho-sama that the boss is not looking for world dominance but rather to control lots of money while rubbing a cat while sitting on his chair like a Bond villain (mentioned in an interview with Gosho). Hence Vermouth hearing the cat's voice getting louder she tried to hang up knowing the boss is coming near her, following this theory it does make sense. The Miyanos are hired by Anokata, as they were working on SB as means to enhance human body with no regard to aging and immortality. Then it means that SB is capable of bringing down human misery, like a silver bullet capable of taking down a werewolf. However, by calling it a terrifying drug, Elena meant it may create a world of chaos were anyone can do anything without any injury or ailment. But her co workers would call it as a miracle due to it's effectiveness and probably the money it can bring, thus they tried to stop it but were killed in an 'accidental' manner. Adding to that, Pisco said to Haibara that she has made the drug to this stage where she can de age humans (maybe not knowing that it is not in the considerations/ or it was a rare case but now is more common/ or that it can de age the human all the way to childhood as proven by Mary's case where she looks more like a middle school student). One more thing, I think that maybe most likely that the Haneda Kohji is as such: Asaca is actually Shuu's father (from a secret police org other than FBI + it might notbe much but his long black hair is copied by Shuu) he was entitled to the job to watch and observe Amanda Hughes who s suspected of being a spy and an investor of a secret crime Org (the BO) and is friends with CIA and FBI to spy on them for the sake of BO and why she was killed as her cover was almost blown. 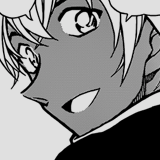 Asaca is probably a nickname for Shuu's father and he is a red herring for Rum. Rum is not known yet, and Haneda Kohji was to be killed by Amanda Hughes and she is only to be killed later by Rum, explaining the different scenarios. Asaca (Shuu's father) escaped knowing he will be suspected and arrested if he stays, and Kohji was mostly killed by Amanda who was most probably a senior agent in BO due to her fake image of a fan and more of a tester of the drug on him, it didn't work and he did not age so she killed him and as a result he is on the APTX 4869 victims list but killed differently. I am guessing Asaca (the father) is a CIA agent and a secret one who was entitled to investigate Amanda, after escaping Rum and everything else he knew the existence of the org and it's mechanism and helped Hondu Ethan infiltrate the Org. He is still a CIA agent and a senior one and maybe the one Kir transfers info to. While Kohji's relation to Shuukichi is that he is a close friend of Asaca/the father and was more of a father to Shuukichi rather than Asaca who was busy with work, Shuukichi adopts the name in respect and in honoring the dead as Kohji was a father figure and a big brother figure. the benefactor and the one taking care of Mary and Masumi is a Sera family member who Masumi knew all her life, Mary was busy with her police work. Shuu who was trying to become like his father but even more trying to surpass his father joined the FBI later to investigate everything on his own without the help of his father's colleagues. Rum is in fact an old long haired strong man (being a strong man is the early SB effects on him, making him at an early age a 2nd in command from the beginnings of the SB effect on him till now), probably as a side effect his hair grows faster than normal therefore his hair is long and feminine (though not necessarily, he can be just choosing so himself), and old man is self explanatory. The Prosthetic eye, is a replacement for the eye he lost in a sort of accident (perhaps when the SB was experimented on him and he gained strong prowess, as side effects his hair grows faster and lost an eye as a result). The case of Kohji's being called a failure on Rum's side by Gin, is probably a reference of letting Asaca escape, who in turns makes an anonymous call to the police to inform them of the crime. Resulting in Rum's rush to escape and no time to clean up the crime scene. Convenient? Makes sense?.. What do you guys think?? Shinan-Kudogawa wrote: One more thing, I think that maybe most likely that the Haneda Kohji is as such: Asaca is actually Shuu's father (from a secret police org other than FBI + it might not be much but his long black hair is copied by Shuu) he was entitled to the job to watch and observe Amanda Hughes. Asaca is probably a nickname for Shuu's father and he is a red herring for Rum. Rum is not known yet, and Haneda Kohji was to be killed by Amanda Hughes and she is only to be killed later by Rum, explaining the different scenarios. Asaca (Shuu's father) escaped knowing he will be suspected and arrested if he stays, and Kohji was mostly killed by Amanda who was most probably a senior agent in BO due to her fake image of a fan and more of a tester of the drug on him, it didn't work and he did not age so she killed him and as a result he is on the APTX 4869 victims list but killed differently. I am guessing Asaca (the father) is a CIA agent and a secret one who was entitled to investigate Amanda, after escaping Rum and everything else he knew the existence of the org and it's mechanism and helped Hondu Ethan infiltrate the Org. He is still a CIA agent and a senior one and maybe the one Kir transfers info to. The case of Kohji's being called a failure on Rum's side by Gin, is probably a reference of letting Asaca escape, who in turns makes an anonymous call to the police to inform them of the crime. Resulting in Rum's rush to escape and no time to clean up the crime scene. So from your theory, why would Kouji implicate Asaka in his dying message as "ASACA RUM" with no mention of Amanda? It is still not clear whether he meant ASACA RUM or another play on the name such as CARASUMA, however it might be his unbeknownst to his real murderer. Perhaps, he knows she was to be killed and pointed out the other victim as to lead the police to that victim who then can tell them of the culprit. Another intake is by writing the two people Asaca and Rum as two different persons, then the police might not have a clue but the FBI or CIA or other secret agency might know that the third person leading double life is the culprit and in this case Amanda who is an investor and a a spy for BO. that is if my theory holds..
Shinan-Kudogawa wrote: Rum is in fact an old long haired strong man (being a strong man is the early SB effects on him, making him at an early age a 2nd in command from the beginnings of the SB effect on him till now), probably as a side effect his hair grows faster than normal therefore his hair is long and feminine (though not necessarily, he can be just choosing so himself), and old man is self explanatory. The Prosthetic eye, is a replacement for the eye he lost in a sort of accident (perhaps when the SB was experimented on him and he gained strong prowess, as side effects his hair grows faster and lost an eye as a result). The case of Kohji's being called a failure on Rum's side by Gin, is probably a reference of letting Asaca escape, who in turns makes an anonymous call to the police to inform them of the crime. Resulting in Rum's rush to escape and no time to clean up the crime scene. I will eat a sock if that's true... Sounds like complete nonsense, lol. Shinan-Kudogawa wrote: I've been thinking, maybe the Itakura program is meant to help further the APTX4869 drug as peer requested by Anokata of Tequila's gain of the list and of Vermouth's deal with Itakura due to the knowledge of the common line of work between the two. Vermouth on the other hand want to have the program beforehand to prevent Anokata from having it, therefore Anokata who is not rushing it is aware of Vermouth's impulsiveness. Bringing his suspicions towards her and sending Gin and Vodka to make sure things get done. This part doesn't make sense. You are basically claiming that Vermouth is trying to outwardly rebel against the Boss! that goes completely against her secretive nature and would put her on the BO's target list! If the Boss knew about it, he wouldn't just give her freedom to do whatever she wants during the Vermouth arc! because she is his favorite, and has a special relationship with him, he wouldn't necessarily kill her either, but he would definitely not ignore her rebellion and just watch her movements if he is as careful as he is claimed to be. Shinan-Kudogawa wrote: However, Vermouth's claim regarding God and the devil, emphasizes that we can be both creators of life and creators of sins. As such, Anokata's original plan is to create a drug that is capable of enhancing the human cells to a degree where injuries and illness are near to impossible (Creating life like a God), but as a side effect deaging happens which explains why Itakura was charged with creating the program in order to ensure it would keep the aging process normal but also enhancing the potentiality of human cells. How could a programmer, who's main area of work is CGI and game development, create a software that needs knowledge of biochemistry/drugs. It makes more sense that his software is not related to the forward progression of the research. 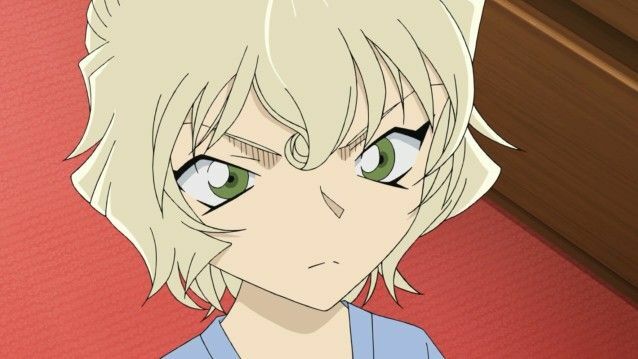 Shinan-Kudogawa wrote: Therefore regarding Vermouth as favorite due to her involvement in the drug and thus is holding the key to revise the deaging drug, while I don't think Anokata is a child but may have deaged to young adulthood if deaged at all. That would make sense as to why Itakura heard the voice of a cat and why Vermouth rushed in hanging up, if this holds up, then the cat as once mentioned by Gosho-sama that the boss is not looking for world dominance but rather to control lots of money while rubbing a cat while sitting on his chair like a Bond villain (mentioned in an interview with Gosho). Hence Vermouth hearing the cat's voice getting louder she tried to hang up knowing the boss is coming near her, following this theory it does make sense. This is completely new to me! give me a link to the interview where Gosho mentions that ''the boss only wants to control money as he rubs a cat while sitting on a chair''! that sounds waaay to cliche and simplistic for Gosho's style! Shinan-Kudogawa wrote: The Miyanos are hired by Anokata, as they were working on SB as means to enhance human body with no regard to aging and immortality. Then it means that SB is capable of bringing down human misery, like a silver bullet capable of taking down a werewolf. Where is the hints/indications to that? there are a lot of indications that they were striving for longevity(as mentioned in my theory). Are you claiming that someone else wrote Shiho's name in the guest book? that Vermouth's halted aging was also just a side-effect? How can Shiho's drug and her parents' drug have completely different side-effects if they were both aiming for the same goal(cell enhancement) and Shiho used her parents' leftover materials? Shinan-Kudogawa wrote: One more thing, I think that maybe most likely that the Haneda Kohji is as such: Asaca is actually Shuu's father (from a secret police org other than FBI + it might notbe much but his long black hair is copied by Shuu) he was entitled to the job to watch and observe Amanda Hughes who s suspected of being a spy and an investor of a secret crime Org (the BO) and is friends with CIA and FBI to spy on them for the sake of BO and why she was killed as her cover was almost blown. Asaca is probably a nickname for Shuu's father and he is a red herring for Rum. 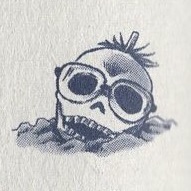 Rum is not known yet, and Haneda Kohji was to be killed by Amanda Hughes and she is only to be killed later by Rum, explaining the different scenarios. Asaca (Shuu's father) escaped knowing he will be suspected and arrested if he stays, and Kohji was mostly killed by Amanda who was most probably a senior agent in BO due to her fake image of a fan and more of a tester of the drug on him, it didn't work and he did not age so she killed him and as a result he is on the APTX 4869 victims list but killed differently. Why would Amanda choose a famous figure(instead of a random person) as a guinea pig for the research? that's pretty dumb and risky! why would an investor even be given the role to test the drug, when she's not even a scientist or has any knowledge on the drug's creation/effect. Gin knew fully that APTX could kill, and his goal was to kill someone, not just test it, so don't think it's the same thing! Kouji also died because of an unknown cause(which is because of the drug's effect and its tendency to disappear from the system) so that directly goes against your reasoning that he was killed differently! Shinan-Kudogawa wrote: I am guessing Asaca (the father) is a CIA agent and a secret one who was entitled to investigate Amanda, after escaping Rum and everything else he knew the existence of the org and it's mechanism and helped Hondu Ethan infiltrate the Org. He is still a CIA agent and a senior one and maybe the one Kir transfers info to. Then why is he pronounced dead to his family? Akai is mature enough to keep a secret if it's the BO they are worried about! If you are saying that Akai already knows, why is his father the reason for him joining the FBI and the motivation to taking down the BO? Shinan-Kudogawa wrote: While Kohji's relation to Shuukichi is that he is a close friend of Asaca/the father and was more of a father to Shuukichi rather than Asaca who was busy with work, Shuukichi adopts the name in respect and in honoring the dead as Kohji was a father figure and a big brother figure. the benefactor and the one taking care of Mary and Masumi is a Sera family member who Masumi knew all her life, Mary was busy with her police work. Shuu who was trying to become like his father but even more trying to surpass his father joined the FBI later to investigate everything on his own without the help of his father's colleagues. Again, what is his driving force here? Subaru wouldn't just mention to Conan that his father was the reason he joined the FBI only to say that he wanted to surpass him. The fact that he mentioned that Mr. Akai was involved in the Kouji case before that already hints to that the reason for Akai joining the FBI has something to do with what happened to his father in the Kouji case! makes sense, however, you are neglecting the fact that Asaka was seen holding a hand-mirror. If it's the same hand-mirror that Kouji left as a dying message, why would Asaka take it if he wanted the police to come and document the crime scene? Shinan-Kudogawa wrote: It is still not clear whether he meant ASACA RUM or another play on the name such as CARASUMA, however it might be his unbeknownst to his real murderer. Perhaps, he knows she was to be killed and pointed out the other victim as to lead the police to that victim who then can tell them of the culprit. Another intake is by writing the two people Asaca and Rum as two different persons, then the police might not have a clue but the FBI or CIA or other secret agency might know that the third person leading double life is the culprit and in this case Amanda who is an investor and a a spy for BO. that is if my theory holds..
Then why carve out the letter shards for "Rum" if he only wanted for the police to go to Asaka for help...? How would Kouji even know that Amanda was gonna get killed because her cover was being blown? Regarding the second intake, why would the FBI/CIA suspect that Rum was involved in the first place? that logic only works if Kouji knew that the FBI/CIA would suspect "Rum"! Asaka was the police's only suspect, so it make senses for Kouji to predict that, but Rum was never involved officially and was never a suspect, so there is no way that Kouji's code could help anyone decipher that "Asaka and Rum are not the murderer, the third person Amanda is" when no one suspected Rum to begin with! Well, that's an interesting theory. Have a different take on what Itakura's Software could be used for since he said so himself that he stopped developing the program for the sake of humanity. So it couldn't JUST be a program used by Vermouth to hide her identity. blackmoon wrote: Well, that's an interesting theory. Have a different take on what Itakura's Software could be used for since he said so himself that he stopped developing the program for the sake of humanity. So it couldn't JUST be a program used by Vermouth to hide her identity. Well, I don't think the software had only one function(or one way of using). Tequila requesting an old software that Itakura left incomplete is indicating BO interest(probably to its humanity-threatening-potential use). Vermouth participating in the requesting(After BO seemingly gave up according to Tequila: "We don't need you anymore") despite her having a bad relationship with Itakura(most likely due to the software he was privately working on) indicates her personal interest(most likely related to her research-eliminating purpose, as Yukiko suspected). So in conclusion, the software has disastrous capabilities(which BO were interested in and Vermouth hated) and capabilities that are in line with her research-eliminating goals. the theory of yours is very interesting and it seems the best and most convincing this time. I realize that this topic is somewhat old, but I thought it'd be better to bump this thread rather than create my own. Given the new revelations as to the possible identity of the boss, Karasuma Renya, and the fact that Vermouth told Itakura that they're "trying to raise the dead against the stream of time". Could it be possible that the current boss of the Karasuma Group wants to revive Renya? He's thought to be dead, and the whole "raising the dead" has been mentioned on at least two occasions so it could be possible. Here's the page where the whole "raising the dead" was mentioned for the second time by Haibara.